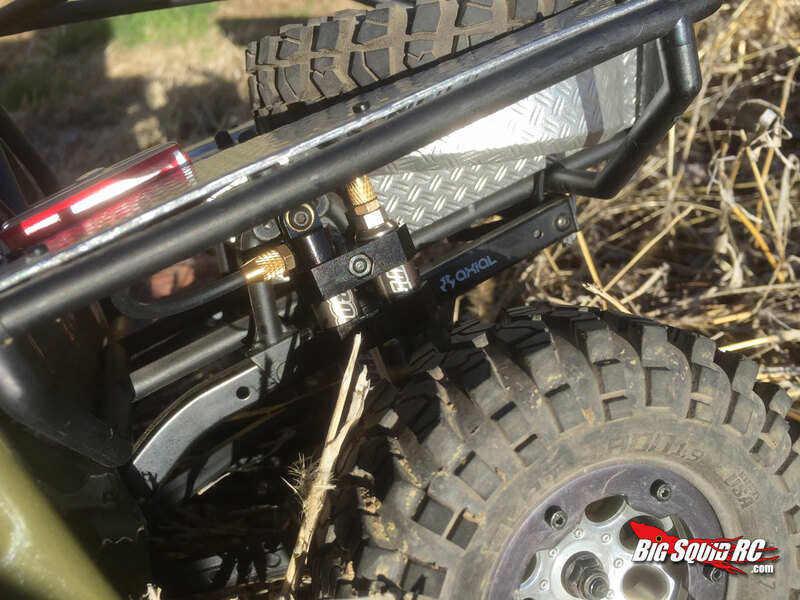 Review – Boom Racing Boomerang Type G scale shocks « Big Squid RC – RC Car and Truck News, Reviews, Videos, and More! Whats up gang, Evol here with a little product review goodness for ya. 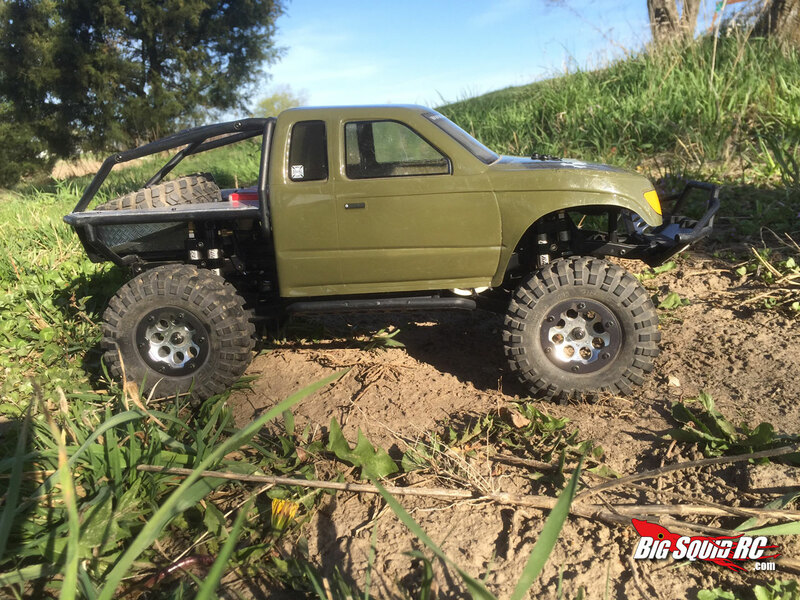 With spring time finally arriving here in the midwest a lot of us would be RC’ers have come out of hibernation to hit the trails and do a little scaling. 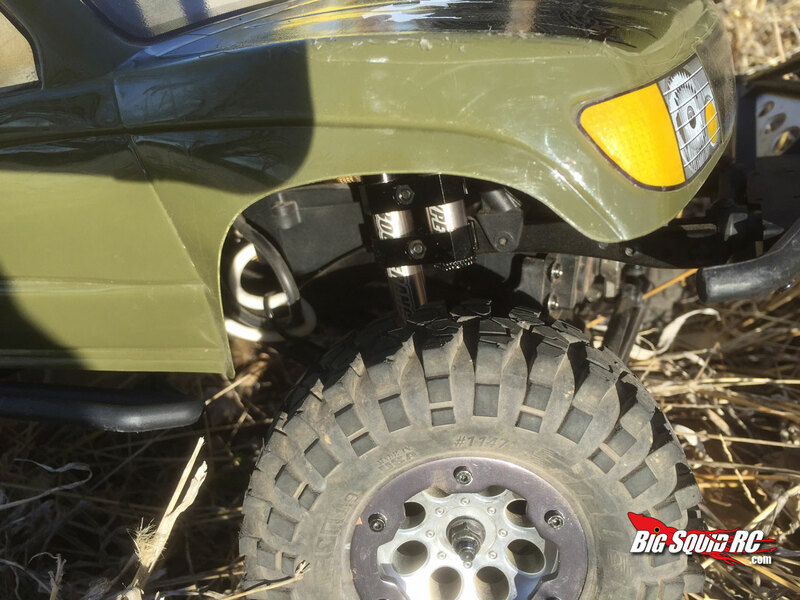 AsiaTees had sent me some Boom Racing Boomerang Type G scaler shocks to test out and I figured it was high time to get them installed and give them a shot. Scale appeal: Overall they are a great looking shock. They recently added the “UNIQ” system where they can actually be custom ordered in multiple finishes so you can mix and match colors to get the exact look you’re going for. They feature functional remote reservoirs and the internal spring design has a very scale realistic look. 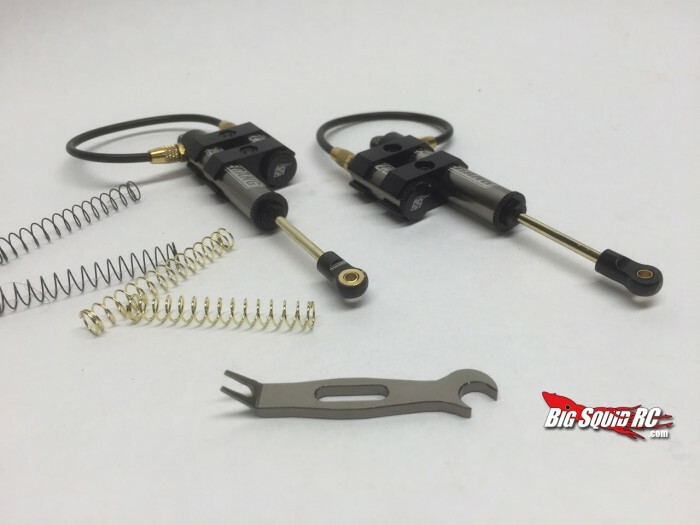 Couple that with some attractive anodizing and all aluminum construction and these shocks would look at home on the most high end scale replica builds. The cylinder is very small in diameter which helps sell the realism and the reservoir mounts are removable so you can mount them anywhere you choose (within reason) on the truck. Performance: For scaling (esp in the 1.9 class) I don’t exactly wail on my trucks. I drive slowly and take enjoyment in watching the suspension do its thing and try to make the truck behave the same way a full size version would. For that type of driving I think the Type G is really well suited. The remote reservoir ensures a nice consistent rebound when you decide to put them to the test. Speaking of that remote reservoir it really is functional. The second cylinder has its own piston and spring to ensure that the shock oil returns under rebound. This helps make for a much more consistent stroke. That feature alone is impressive for what these things cost. Great bang for the buck! It’s not all sunshine and bunnies though. These shocks suffer a bit in some performance areas as well. One area I can nitpick at are the spring rates. All but the hardest spring were way too soft even for my bone stock SCX10 and with the hardest spring installed I just wasn’t really happy with my ride height. One of the trade offs with having that nice scale looking internal spring is that there is no preload adjustment. That means you cannot change the ride height without getting out the nippers. An internal limiter would have been nice to make them a bit more tunable. Given time I’m sure I could come up with something to make the necessary adjustments, but I have to look at how they come out of the box. Durability: There is always a trade off here when you take scale appearance into account. For that reason the Type G has a smaller diameter body and in turn a smaller diameter shock shaft than your usual 1/10th scale damper. The all aluminum construction will certainly help them survive a pummeling and the shock cartridge that threads into the shock body is also aluminum where most companies would use plastic. I had no issues to report during my testing and under normal scale driving conditions everything performed flawlessly. Assembly/Installation: The Type Gs come fully assembled, but you must take them apart to install your spring and oil. They come with a clearly printed instruction page that walks you through the fill up procedure which makes it very simple. As far as bolting them to my truck, that required a bit more work. The eyelets on both ends of the shock are very narrow. So much so that I had to shim them up to make them clear properly on my test truck. 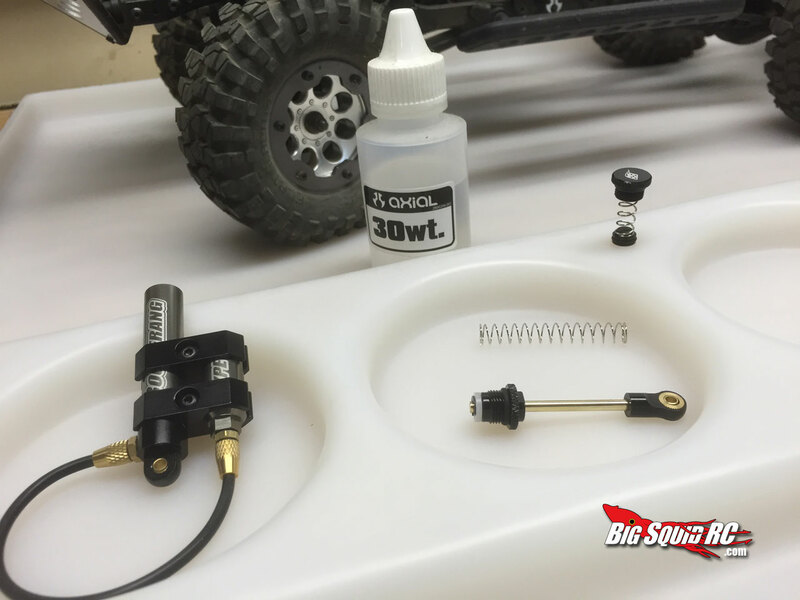 They do include several spacers that allows you to get the job done with no additional parts to buy but id rather see that stuff built into the width of the bushings. I had to run spacers at both ends of the shock and I just feel like that was a bigger pain than it needed to be. Features: As cool as the remote reservoirs are; these shocks come with brass plugs if you wish to run them as traditional dampers. This will be handy if you blow a line on the trail, you can just thread that in and continue on your way. They did include a couple of extra reservoir lines as well should you need them. 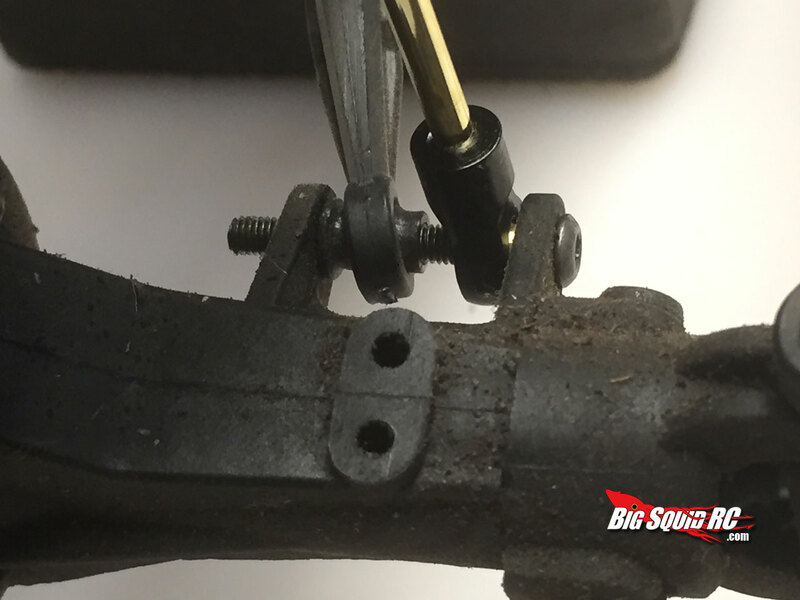 Each pair of Type Gs include a shock adjustment tool which is cool, unfortunately it isn’t clear what that tool is used for. I discovered that you can adjust the shock cartridge with it to tune the amount of pressure it puts on the shock shaft. 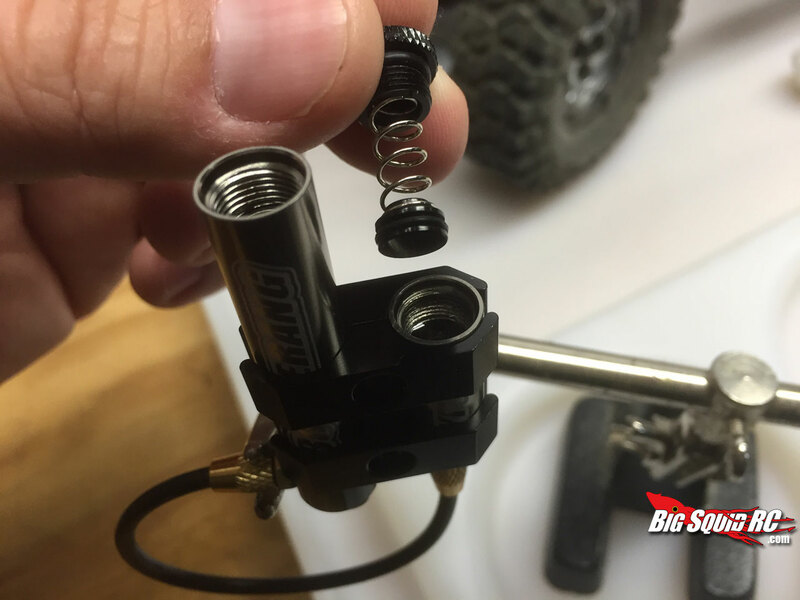 If your shock is seeping a bit you can nudge the threaded portion to put more pressure on the o-ring. The shock shafts are titanium nitrade coated which should make them smoother and last longer before they need to be replaced. Value: At 35 bucks a pair you get a for your money. Compared to others in the category these shocks are a bargain. They lack features like adjustable preload but if that is a show stopper you are probably not their intended market. These are meant for scale looks and adjustability takes a bit of a back seat in that market. Problems/complaints: Using the spacers to mount them was a little annoying but other than that I did not have any issues. No leaks, and any binding I had I was able to tune out with the adjustable shock cartridge. I do wish they had a wider range of usable spring rates. 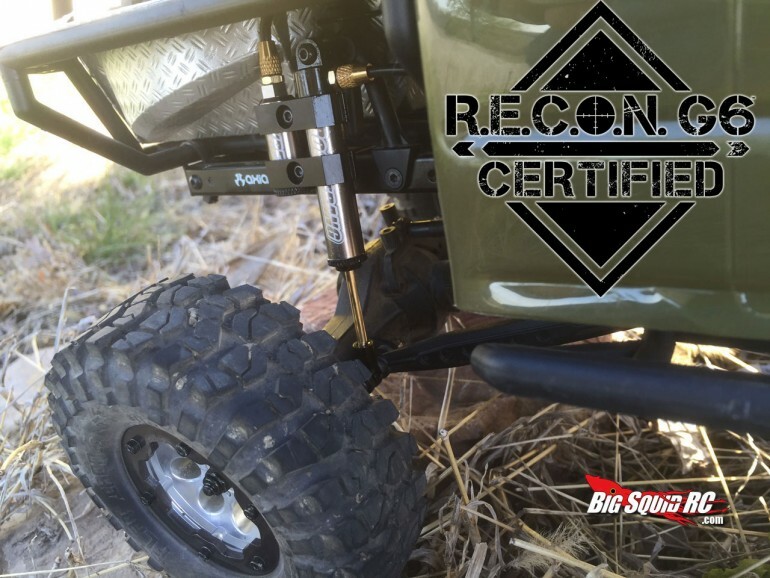 Overall: The Boomerang Type G’s are the official shock of the RC4WD Recon G6 scaler series that crosses the nation. A G6 event often tests the limits of driver and machine and if a set of these can survive that trek they are certainly tough enough for the everyday scale enthusiast. If you’re in the market for some new boingers for your favorite scale vehicle you should definitely check a set of these out.